Breakfast at 7:00 a.m., we landed on Floreana Island by 7:45 a.m. We took a short walk around the island; this island is mainly known for the pink flamingos. There is more soft wonderful sandy beaches to explore. This beach that we are on is a mixture of brown and green flecks. All of the beaches are made up of the different types of volcanic rock/ash that make up the island and shoreline. 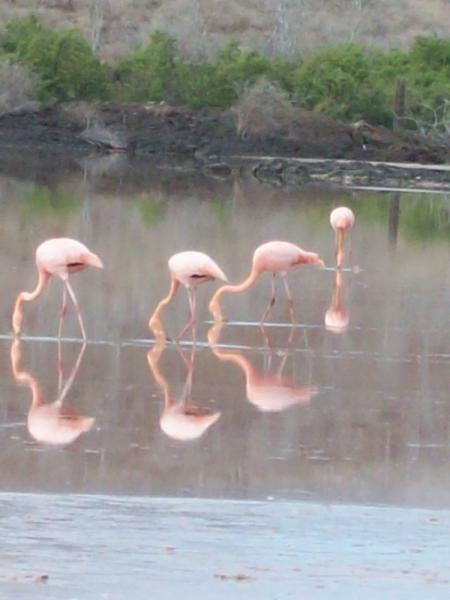 In the middle of Floreana Island there is a lagoon just covered with pairs of pink flamingos. You can hear them eating the shrimp; they are eating as fast as you can think. They filter the water and eat the shrimp; they do over 300 pumps per minute. After exploring a white sandy beach on the other side of the flamingo lagoon we sat on a scenic part of the island and talked to our guide about how the GI got their name and how they first became settled and the first persons that lived on the islands. We head back to the boat for the last snorkeling time for those who want to snorkel. Greg suited up and headed out with the group. He says that the water is so clear (he can see for over 20, 30 feet deep, the water is that clear) and that the fish and wildlife is just beyond imagining. After lunch we had a very short navigation, just around the corner, we stopped at “Post office Bay” a traditional place where old time mariners would leave mail/post for the next person who was going to his town and would pick up “the post” and deliver it to his loved ones. We left a post in the same traditional way, but I am not very sure if it will ever get to its destination. After group photos at the post office we watched the various crew members of the 5-6 boats that are always anchored together at the same islands, play a pick up game of “football” (soccer). Even some of the passengers joined in. Then back to the boat for a 4-5 hour navigation to Santa Cruz Island. We are now anchored in a bay with tons of other boats (150-200), there is even a National Geographic boat in our harbor. It is huge, and all lit up. After dinner we are allowed to dis-embark for a couple of hours and “see” the town. 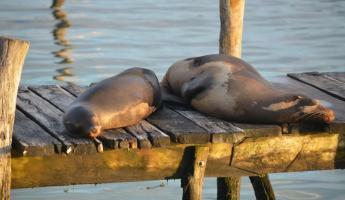 I am almost just ready to stay on the boat and see the “critters”. People are a jolt, after the peace and quiet of only 12 persons on board and no talking animals. We walked around town for a while, and then went back to the boat via a water taxi, to pack and get ready to leave the boat for good in the morning.